Date night! That elusive, rare, and very important routine to keeping your sanity and relationship intact. Whether you have a date night once a week (bless you), once a month, or once a year, when you have the chance to spend time with each other kid-free, make it count. Huntsville is ever-growing and date nights are getting more fun & varied in the Rocket City. Check out some of our NEW 2019 favorites for a kid-free date night, as well as a few classic ideas. To keep things fun and spontaneous, make a popsicle stick pull to keep things fresh and interesting. 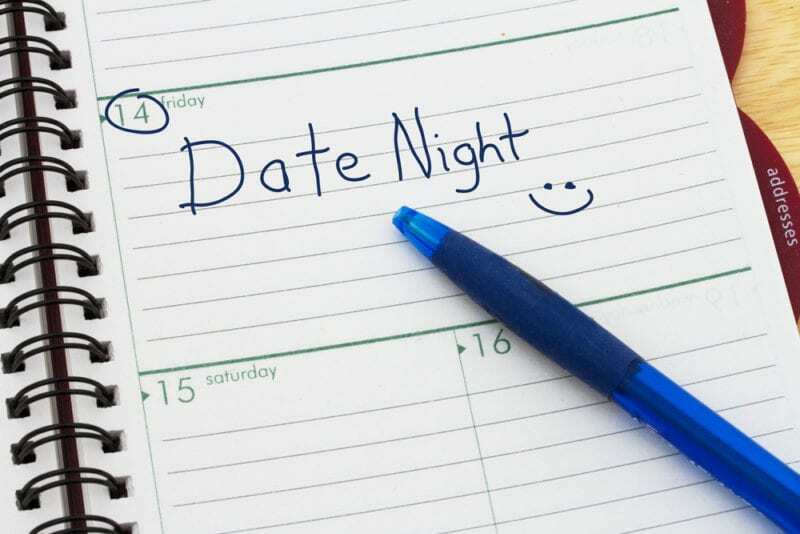 Write down one restaurant or activity on a popsicle stick, put in a jar and draw one out each date night for a impromptu itinerary if you are having trouble deciding what to do. We love this Date Jar idea from Foxwell Forest! Tip: Check out the cocktail menu presented inside of a book! I Recommend: The Southerner – fried green tomato, pulled pork, pimento cheese served on a biscuit with tots. You won’t find a more romantic view in all of Huntsville! Tip: You can buy bottles of wine and accessories in the small gift shop. Fun Fact: The screens on board take you along train rides throughout with world while you listen to smooth jazz. Tip: Grab some dinner here after going Axe Throwing with Civil Axe, located on the second floor of Campus 805 or play a pinball arcade, just steps from the speakeasy. Serves a variety of foods and chili and chili topped foods like fries, burgers and wings from Anaheim Chili. Every Saturday and Sunday in the warmer months. On call other times. Bike around Big Spring Park from the downtown YMCA station. Feed some ducks, stop and grab some pizza and drinks at Pane Vino, located across from the fountain at the base of the Museum of Art. Tip: Closes at 6pm on Saturdays so plan to spend an hour here and grab some dinner nearby at locally owned Beaureguards for some wings, burgers and beer after the range. New, clean and friendly shooting environment. Great for beginners and experienced alike. Huntsville has two axe throwing places, one located just off the square downtown and one located inside the multiuse Campus 805 off Governors Drive near downtown. No Previous Axe throwing experience required. Axe Coaches will walk you through a safe throw. If you choose Civil Axe to get your Axe on, head downstairs after to the hidden speakeasy (located behind a set of lockers) for some dinner and drinks from Straight to Ales kitchen. If you choose the off the square location of Rock Axe City, head across the street to The Martin for drinks and entrees and an Honest coffee nearby to end the night. A Huntsville treasure, Lowe Mill is unique, eclectic, and a great place to go for date night in Huntsville. Palette to Palate: Paint and carry 16X20 inch canvas while enjoying Chef Will of Chef Will the Palate delicious creations.